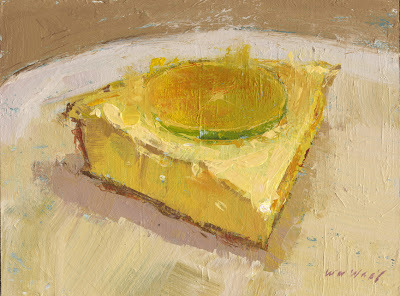 William Wray: Do you like pie? I always like your color. Oh, I really love this work!! a pie like this, yes! now you need to paint a good cup of coffee to go with it . Yes I like pie. This one made my mouth water! Only if it is painting by you! I love your pictures and I like your blog. I see you're in your "Wayne Theibaud" phase! Seriously, very cool piece of pie, Bill. Just found your blog and love your paintings - composition and paint handling wonderful. An inspiration. An urban landscape looks just as delicious as a piece of pie when you paint it - how can that be? - your work is simply beautiful, I really admire it! I like Pie. I like chocolate the best. This is looking like a lemon custard pie, that be my guess. I forgot the artist I saw who popularized painting deserts. But this one can stand on its own. Nice pie! E-- you have done some great ones! thank you pie lovers everywhere. watch for some meat coing soon.